I started baking bread a few years ago & have become hooked. It’s amazing how small changes in ingredients, technique and even weather can effect the finished product. This recipe yields 3-4 loaves depending on how you divide the dough. Leftover bread can be frozen for breadcrumbs and day-old Baguettes can be used for french toast! 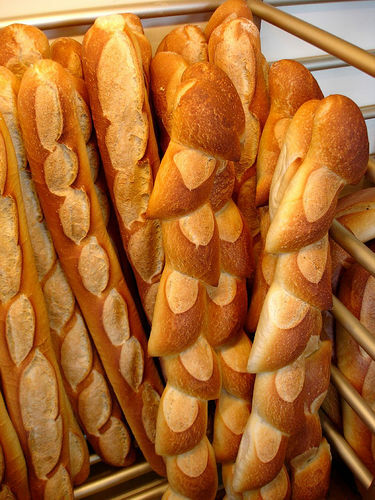 To form the baguettes: Cut the dough into 4 equal pieces. Press each piece of dough into a rectangle and fold the long sides up into the middle. Roll each into a log, taking care to close the seam. Taper the ends by gently rolling it back and forth. Lay the dough on a perforated baguette pan (or a sheet pan that is dusted with cornmeal) and cover with a towel. Let the baguettes rise for another 2 hours. With a lame (bread slashing tool) or a very sharp knife, make 4 or 5 diagonal slashes across the top of each loaf. Brush the tops of the loaves with egg (or milk). Bake for 40 minutes, until the bread is golden brown. Cool on a wire rack.